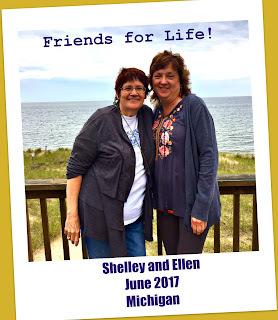 Recently I travelled to Holland, Michigan to visit with my best friend from high school, Ellen. Wherever I go I am always on the lookout for art and this trip was no exception. As usual I took a zillion photos! I decided I'd shared my visit with you. This is part three, the final installation. I already told you I love Michigan. The people and the natural beauty make it one of my favorite places. 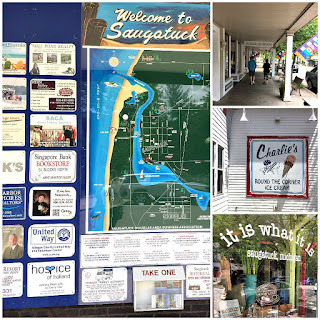 One more reason is the town of Saugatuck! 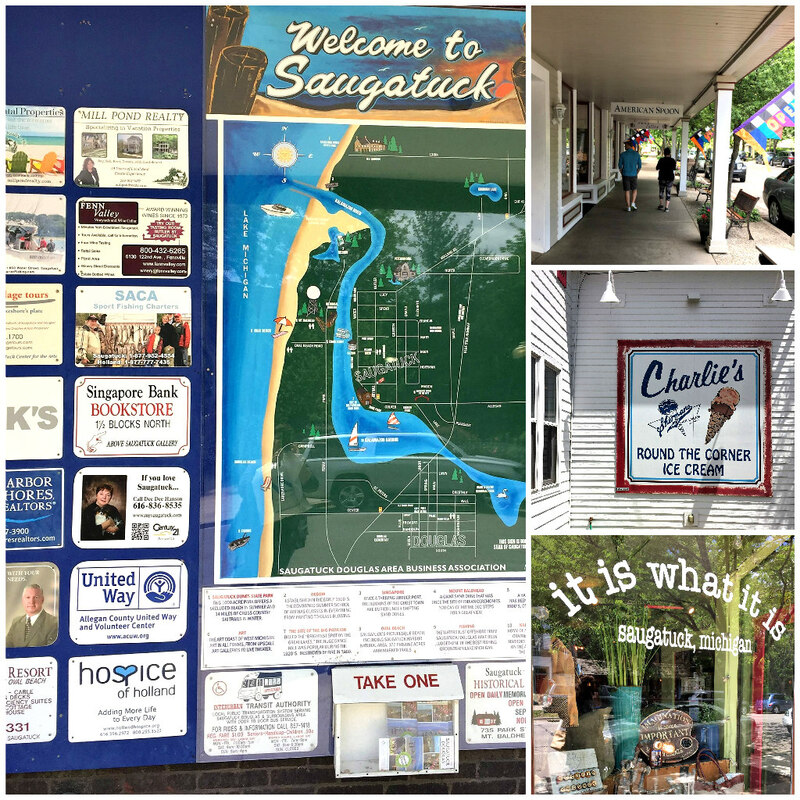 It’s an artist haven, filled with galleries, restaurants and unusual shops. Ellen treated me to a day-long visit. We drove there and started our day with a great lunch at a restaurant called Mermaid Waterfront Bar and Grill. It was a beautiful day so we sat outside right along the marina. What a view! After finishing our yummy lunch (and wine!) we started on our adventure. First stop was this little shop near the marina. The sidewalk was filled with color and creativity, just a small smidget of what we would find inside! We walked up the block and turned a corner…that’s when we hit the jackpot! 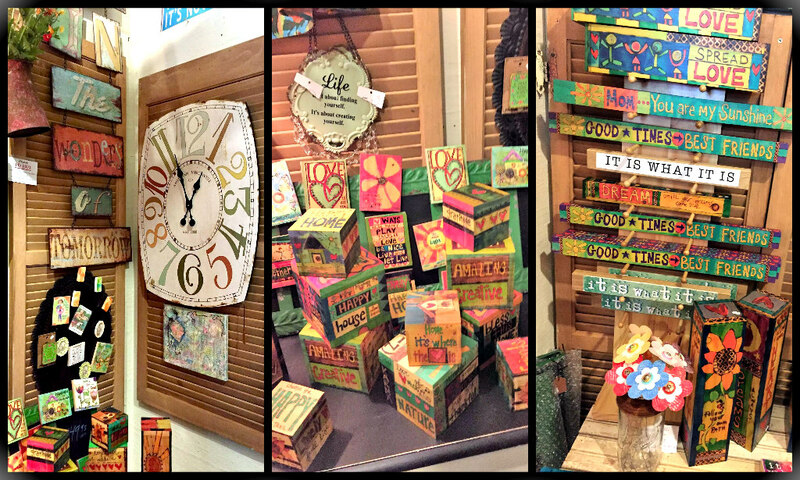 Block after block, shop upon shop – art of all kinds. CLICK here for their Visitor's Guide. We spent quite a bit in the shop, "it is what it is". I especially loved these works! Our final stop was a shop called, Good Goods, by far one of my favorites of the day. It was packed with the most beautiful work. Here are just a few of the many pieces that filled their two floors. 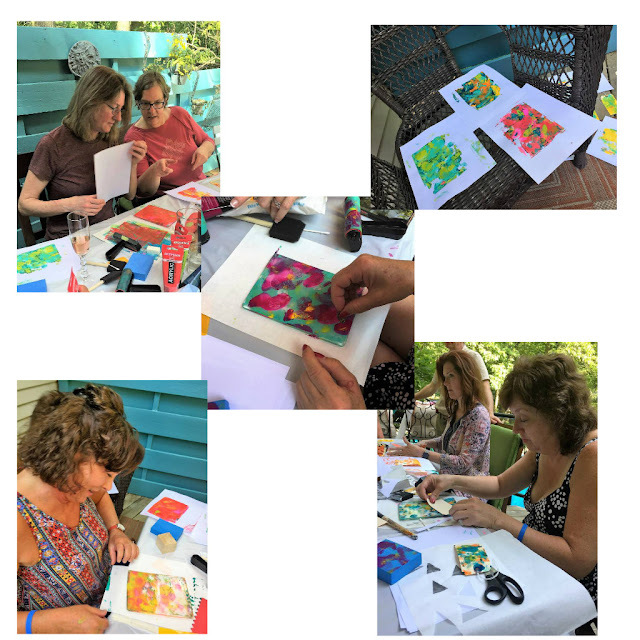 Did I tell you about our little art class we had? Ellen’s good friend Tracy hosted a small gathering of their friends. We had it in Tracy’s backyard, right by her pool! I demonstrated monoprinting to the group. 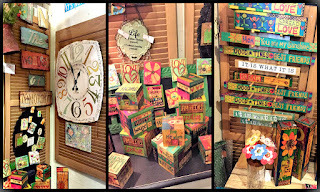 Besides clothes, I had packed another suitcase art supplies such as gelli plates, brayers, paint, stencils and other goodies. I think the ladies had fun. It was something none of them had ever tried before. It was exciting to see their faces light up as they experimented and pulled off their prints! Tracy, our hostess is a caterer. She made the most amazing food and it was a real treat. Overall it was a great time! I hope you enjoyed seeing moments from my trip. I really miss Michigan and my friend Ellen. I need to go back and SOON!